In July-August “Water Days” were organized in Uzbekistan for children from various regions of the country. The events were held within UzWaterAware project, implemented by CAREC and funded by the European Union. The project and events were supported by CAREC partner NGO “Suvchi”, EkoMaktab and volunteers. During this period, two “Water Days” were carried out in camps. In addition, project partner NGO “Suvchi” organized an interesting presentation for more than 180 children in six regions of Uzbekistan. The events on increasing children’s knowledge about water were held in Syrdarya and Samarkand districts, Surkhandarya, Fergana and Khorezm regions, as well as in Karakalpakstan. 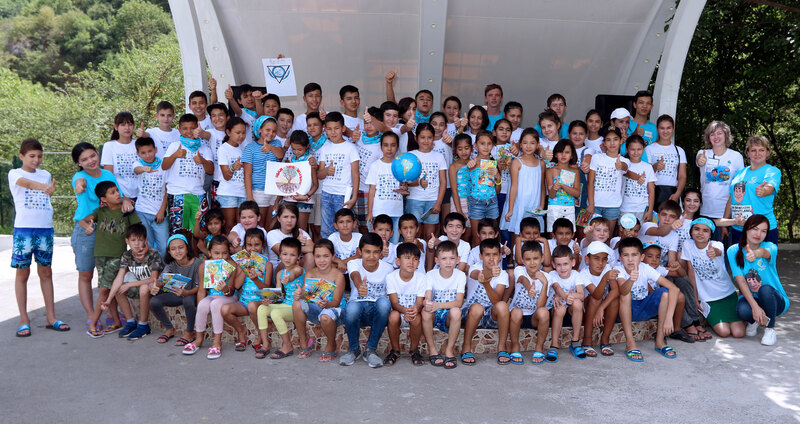 In general, nearly 780 children from various regions of the Republic learnt a lot of interesting and useful information about water and environment during summer holidays. UzWaterAware project (Raising Awareness and Partnership for Sustainable Water and Environment Development in Uzbekistan. Component 3) pays special attention to the formation of respectful and careful attitude to water and environment, as well as raising the awareness on the efficient and productive use of resources. “I really enjoyed the experiment with water when we saw how people affect its quality. We were taught that all our actions have the consequences. Each of us can save water and Earth from drought and pollution. I will definitely tell my family and friends about this,” Madina from Tashkent region shared her emotions during “Water Day” in “Asaka” camp. Volunteers also actively participated in "Water days". After training, they hold “Water Days” with children themselves: they communicate, share knowledge, participate in games and help in quizzes. They explain new information and support the project in fostering a respectful attitude of children and teenagers to the environment and resources. The senior student of TIIAME Ms Yulduz Eshmatova participated for the second time in “Water Day” as a volunteer. She said that children made a pleasant surprise with a very thorough preparation. “It is nice to see how their attitude to water and environment changes during games, experiments and quizzes. There is no doubt that UzWaterAware project makes an important contribution to fostering not only children’s respect to water and environment, but also affect the adults through younger generation,” Ms Yulduz Eshmatova shared her impressions. At the end of “Water Day”, all groups gave short performances revealing their knowledge. One of the groups prepared a fairy-tale about fish living in a polluted sea which later addressed the humankind with a message to save water. The next participants told a story about a community that didn’t respect water and that caused the draught in the nearby village. And the third group prepared interesting facts about water, nature and interrelations of all living beings on the planet. The performance was supported with a story about an ordinary family, where one of the brothers didn’t turn off the water when it wasn't used and another one explained why that was wrong. Following the results of the event, participants were given presents and children’s environmental magazine “Rodnichok” / “Buloqcha” (spring). This magazine is the only environmental edition for children in Uzbekistan. It is supported within UzWaterAware project for its further sustainable and independent development. Within cooperation with NGO EkoMaktab, further development in the sphere of environmental education for children is planned. Special training and methodological modules for teachers will be developed to help introduce an exciting and interactive method of teaching for extracurricular and complimentary classes in the field of ecology. The elaborated materials will be introduced in the regional branches of the national children’s centre for geography and ecology “Barkamol Avlod” for holding “Water Days” and other thematic events. In addition, based on the methodological materials, it is planned to conduct trainings on upgrading knowledge and skills of school teachers to cultivate a respectful attitude to nature since childhood. The UzWaterAware project is implemented by CAREC with the financial support of the European Union during the period 2016-2019. The overall objective of the project is to sensitise and generate a greater degree of awareness on the strategic importance of water saving, water conservation and environmental protection under the conditions of climate change.